The Clark County Antibiogram represents data from participating local hospital and commercial laboratories in Clark County. Participating laboratories report antibiotic susceptibility testing results to Southern Nevada Health District for the time period of 6 months, twice a year. The report includes inpatient and outpatient data. Data represents only bacterial isolates collected for diagnostic purposes; no surveillance cultures are included. Only final, verified test results from the first isolate per person, regardless of culture source within the timeframe, are included. The Clark County Antibiogram summarizes the antibiotic resistance patterns among the most common microorganisms detected. Only organisms with testing data for ≥ 30 isolates are included in the antibiogram. 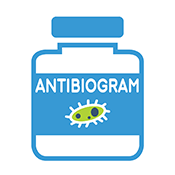 This county-wide antibiogram was created to aid medical professionals in selecting the best empiric antimicrobial treatment while microbiology susceptibility results are pending, and to detect and monitor trends in antimicrobial resistance in the community. See current and historical restaurant inspection grades from the Southern Nevada Health District. Find information for all restaurants in your area or search for restaurant grade cards by name. View Yelp ratings for restaurants.